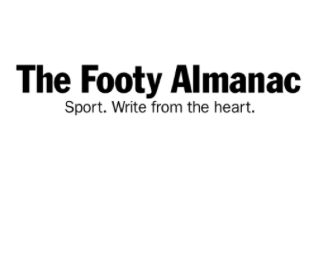 The Football Almanac: Echuca Blues, of different sorts. Once again Maryanne and I went to Echuca for their marvelous Winter Blues Festival. We were part of an estimated attendance of around 20,000 who enjoyed the festival. This was the 19th annual Winter Blues Festival with Echuca providing a marvelous setting for a top weekend of music, merriment and more. We saw/heard artists as diverse and talented as; Sammy Owens, Toni Swain, The Hornets, Justin Yap’s Band, and Bonnie Kay and the Bonafides, all playing fantastic sets to appreciative audiences. Sadly one of the greats of Australian blues, Chris Wilson, was not performing this year. Tragically, Chris is very unwell. As a history aficionado I thought of another famous Blue that took place in Echuca – actually it was around 20kms outside of Echuca, at a spot called Dead Horse Point – back on Thursday March 20 1879. In this context “blue” being an Australian term of yore, describing a fight. The fight took place just after dawn, as Sydney’s legendary Larry Foley squared up against Melbourne’s Abe Hicken. Hicken had issued a public challenge to Foley, asking he fight for the title of Australia’s bare knuckle champion. Melbourne was meant to host the bout, but due to the Victorian Police saying they’d declare it unlawful and break it up, it was moved out of Melbourne up to the border region. This was just after the Victorian Government legalizing gloved boxing, rendering bare knuckle boxing illegal. Spectators came from near and afar with a crowd estimated in excess of a 1,000. This includes 700 people who came up on a train from Melbourne. Though the bout was meant to take place in Victoria, due to the legal problems it was held just across the river on the New South Wales side. Across the Murray River 20 of Victoria’s finest constabulary watched unable to apprehend the fighters let alone any one else they sought. Apparently Constable O’Meara was the first to arrive at the location advising the fighters and all those in attendance it was illegal and that he would break up the fight. Utilising boats moored adjacent, all and sundry crossed the Murray with the bout continued on the NSW side of the river. Apparently in the audience was Ned Kelly, with his best friend Joe Byrne, this taking place a few weeks after their famous raid on Jerilderie. We’re aware the four young outlaws rode into the sleepy Riverina town on the Saturday night bailing up the police, locking them in their own cells, and then masqueraded as police reinforcements. Over the next few days they had their horses shod, for which they billed the NSW police, Ned dropped off his manuscript, which became known as the Jerilderie letter, they robbed the local branch of the Bank of New South Wales of over 2,000 pounds, held 30 ‘hostages’ in the Royal Mail Hotel, Ned giving speeches, also shouting them drinks, then rode off disappearing from public gaze for over 16 months. Justin Corfield in his work, The Ned Kelly Encyclopedia, alleges their presence at the Foley-Hicken fight has been authenticated. The doyen of Kelly Scholars Ian Jones alleges Ned wrote to the British boxer Jem Mace, challenging him to a fight at a ‘secret location’ in the Strathbogie ranges, well out of police reach. Ned said he would show Jem, ‘how they box in the ranges’. Mace, often called the father of modern scientific boxing, had previously fought Larry Foley in an exhibition bout. Ned had a well-earned reputation for being handy with his fists. There’s the marvelous photo taken of Ned aged 19, in August 1874. He’s just beaten Isiah ‘Wild’ Wright, in a 20 round bare knuckle bout in Beechworth, for which Ned was bestowed the honor of being the unofficial Boxing Champion of North Eastern Victoria. Wright became a close friend of Ned, and during the period of outlawry he was a loyal sympathizer, being one of those present at Glenrowan; he also visited Ned prior to his execution. PS: You may wonder why I’m talking about Ned Kelly in the Footy Almanac. His link to the great Australian game was that when he was 10 he saved a drowning 7 year old boy, Richard Shelton, from the flooded Hughes Creek near Avenel. Richards’s grandson was Ian ‘Bluey’ Shelton a duel premiership player for Essendon in the 1960’s. Also on football, the weekend of the Winter Blues Echuca hosted Kyabram. Kyabram were on a roll, coming into the match on a 56 game unbeaten streak. After a four goal to nought opening term Kyabram extended their winning run to 57, triumphing, 15-14-104, to 4-8-32. Great to learn about boxing on the Murray and Ned Kelly. When we lived in Echuca in the 1960s the family had a corner store in Echuca East. Dad had the soft drinks “rights” for the two-up school played on the bank of the Murray (note the Goulburn and Campaspe rivers flow into the Murray at Echuca). As the game was on the river and technically in NSW, the cops couldn’t break-up the school.